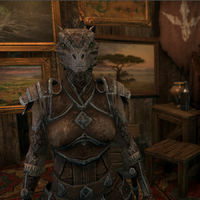 Eatzapa is an Argonian fence who can be found at the Outlaws Refuge in Evermore. "I grow weary of moving the same old goods. Have you brought me something new?" "I miss being on the other side of the counter ... procuring, instead of purchasing." "Sorry, I can't help you right now. Return later and we can work something out." This page was last modified on 27 July 2018, at 12:08.